Follow in the footsteps of one of the biggest internet stars, PewDiePie, by creating your very own pocket Tuber in PewDiePie's Tuber Simulator! Will you become the biggest, baddest Tuber ever in no time and kick PewDiePie out of his own throne? © 2016 Outerminds Inc. Revelmode © 2016 PXM Network Ltd. All Rights Reserved. Become a famous streamer and decorate the studio of our dreams. At least, that’s the idea in PewDiePie’s wacky pixelated builder. As we gather fans and fame, we're adorning our space with cooler and cooler stuff. (Our favorite is a tiny dinosaur.) 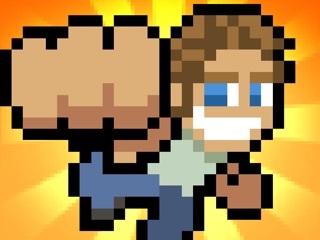 Like Legend of the Brofist, this game is overflowing with fan service and offbeat humor. We found the entire premise thrilling—and weirdly inspiring. I got this game originally to try it out. Next minute I’m addicted. This is truly a creative game and I know all things can have improvement but I can’t see anything here. It doesn’t constantly spray ads in your face but when you watch them on your own time, give you fair rewards. I love how customizable you can be with your room decorating to your video titles. I LLOOOOVVE the classic 8-bit style that is giving me plenty of nostalgia but I still feel like I’m playing a new game. I think this is perfect because I’m not bored because of to much or no feels. I think the trending and quest systems are set up brilliantly and the brains section is although like most skill upgrade menus in games is still pretty unique and cool in a way. I am also glad that it is free and earning stuff doesn’t take forever so you don’t really feel like buying in app purchases. I love this game and think personally it is better at keeping you reeled in than Fortnite. (Which I also am obsessed with) anyone reading this, if you’re a kid then get this ASAP. If you’re a parent wondering the quality before you download it then trust me it is SAFE, FREE, and FUN in so many ways. To anyone still reading, this game is great and I’d recommended it. I downloaded this in 2016 when it first came out. And I was super into it. I played it for a while and decided to actually pay for in app purchases. I eventually stopped playing. But whenever my phone broke at the end of December 2018 the only iCloud backup I had was from 2016 and the app was back on my phone. So I started playing it again and remembered how much I enjoyed it. One of my favorite things is how you could totally play this app for free without watching a single ad. Almost every other free game I have attacks me with ads but tuber sim gives me the option to watch ads for small in game rewards. The other thing I love about this game is how customizable it is. I get to pick exactly where I want any item to go, like by the millimeter. I can move any item just a hair to the left or a tiny little bit to the right. And the new crane mini game is addicting. I’m trying to think of anything I don’t like and only one thing comes to mind; I wish there was a way to select multiple items to put them back in storage. Other than that I can’t think of anything. ads are completely optional and the level of customization is insane. I really really like this game.